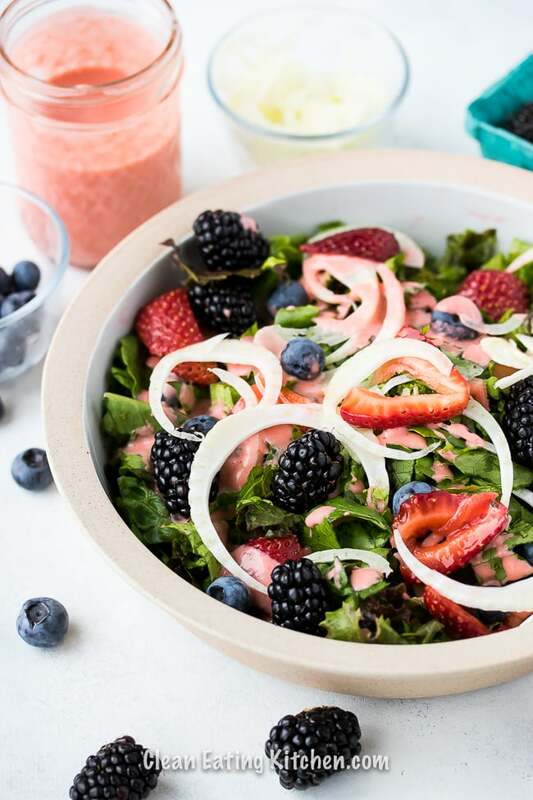 This easy summer salad is perfect for a healthy side dish, and is so delicious with a homemade dairy-free strawberry yogurt dressing. 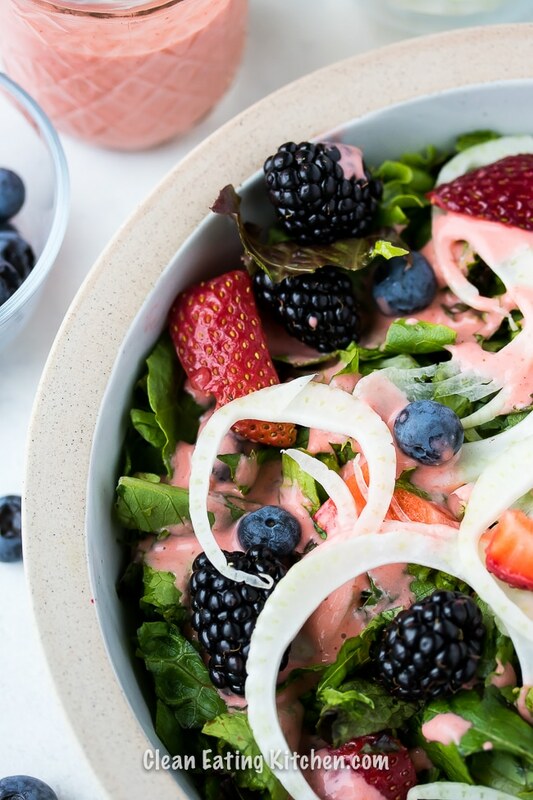 You could call this a patriotic salad, but then you might forget to make it other times of the year. That said, don’t you think it looks pretty with the blue and red berries, and the white fennel shavings? A trip to the farmers’ market inspired this recipe and made me remark that I really need to go there more often. Do you have a farmers’ market in your town? Honestly, it’s my favorite connection to my local community, and it’s worth the extra effort to get there. I always run into someone, and that makes me feel like I’m part of the fabric of my sleepy little beach town I moved to several years ago. At this point, I probably count as one of the eccentric locals tooting around town. That makes me happy, although I’m not quite as eccentric as the surfing goat guy I always run into! Yep, you read that right, surfing goats (you have to see it to believe it)! California farmers’ markets are really something special, and make you marvel at the breadth of produce that gets grown here. Where I live is about halfway between Los Angeles and San Francisco along the coast, and it’s a Mediterranean climate that is fairly mild year-round. I was born and raised in Oklahoma, so summer temperatures in the low 70’s with low humidity are a dream come true. Plus, strawberries! I call for three 1/2 pints of berries for this recipe, but please feel free to use whatever berries you love the most. If you’re not making a red, white, and blue version, then you definitely have more freedom. 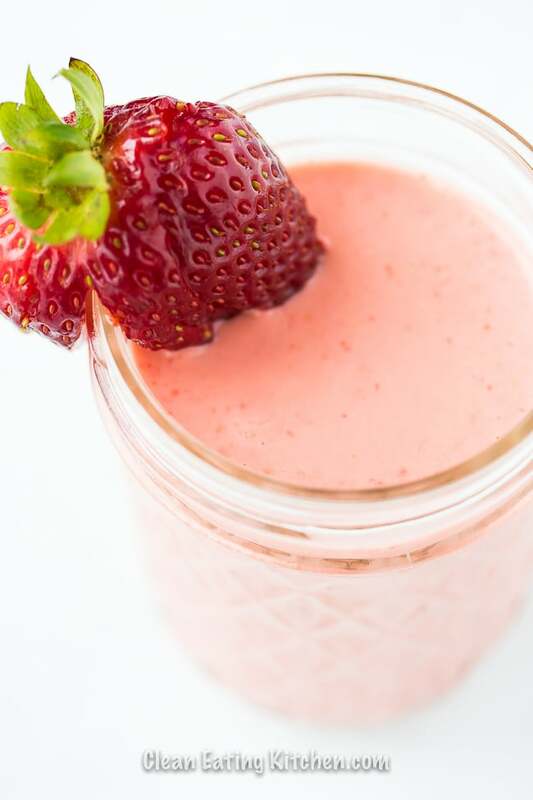 Heck, you could even use frozen strawberries for the dressing. I would suggest defrosting them in the fridge before blending them if you go that route. The other important part of the salad dressing is finding a dairy-free yogurt at the market. There are some great versions available now! My first choice is coconut yogurt because it is mild in flavor and thick like a traditional yogurt. Look for it in the refrigerated section of your health food store. 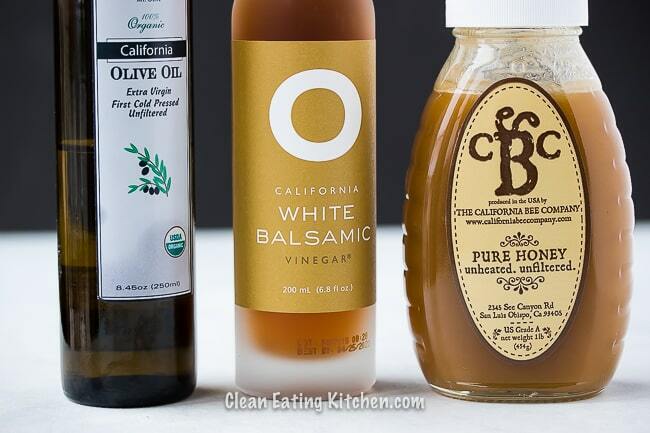 The other three of five total ingredients for the dressing are olive oil, vinegar, and raw honey. Again, use what you have in your pantry or can find locally. Also, to make this dressing 100% vegan, please use 2 Medjool dates in place of the honey. 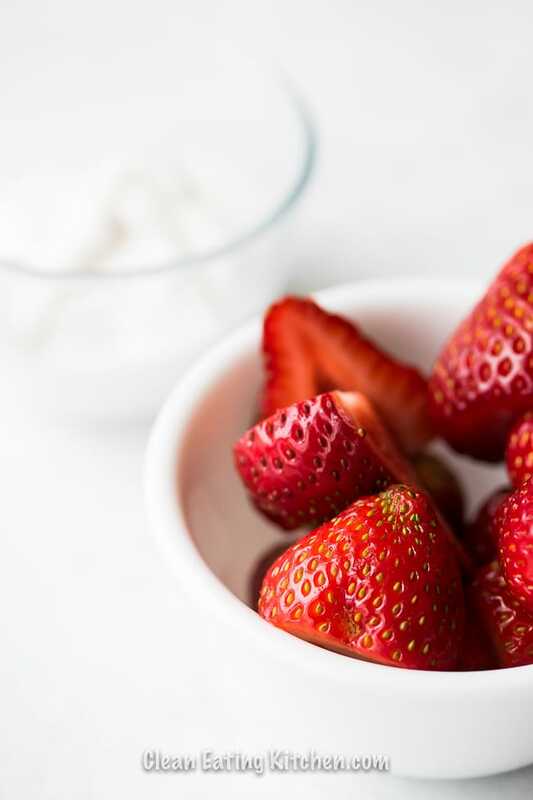 The dairy-free strawberry dressing gets made simply by blending strawberries, yogurt, vinegar, olive oil, and honey. How easy is that? And, what a pretty dressing, too. I used to make all my dairy-free salad dressings with hemp seeds or cashews, but using coconut yogurt might just become my favorite trick to get a creamy texture. 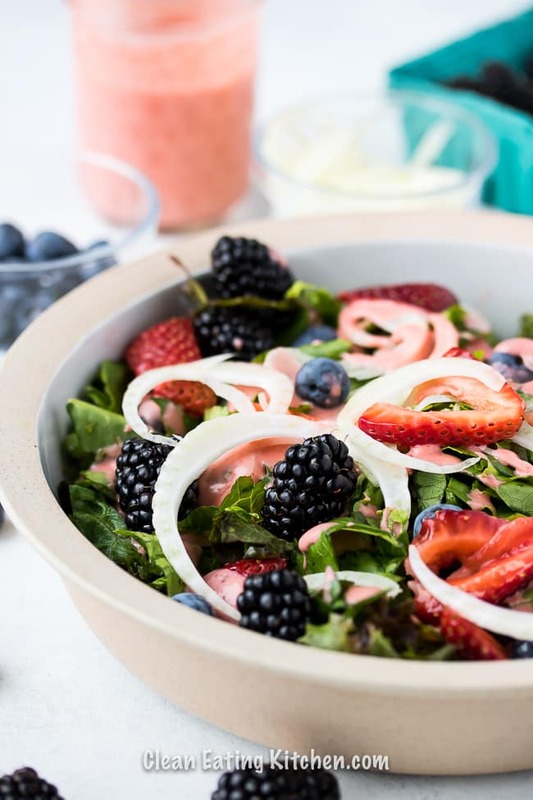 After you make the dressing in the blender, I suggest you simply pour it over the salad, toss it, and then top the salad with the rest of the berries just before serving. Would it be cliche to say this tastes like summer? It does to me! 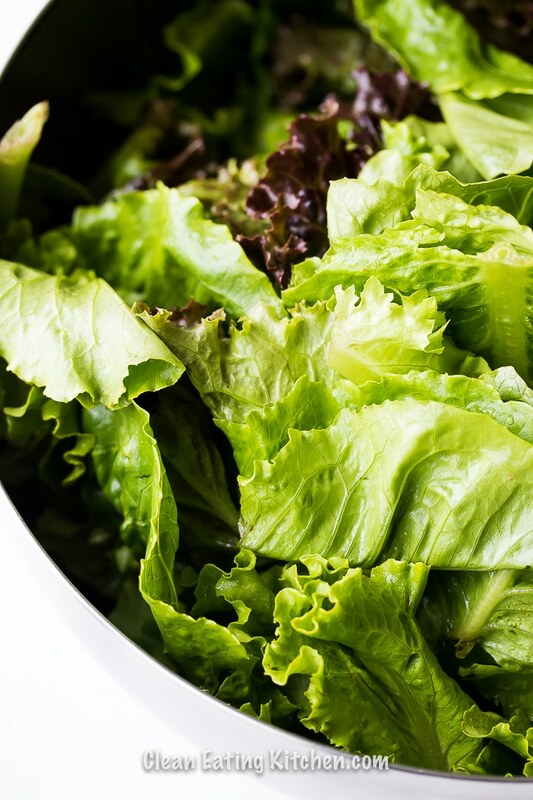 Combine the salad greens in a large mixing bowl. Use your hands to gently tear the leaves into bite-sized pieces. Use a mandoline to cut the fennel bulb into thin shavings and add to the salad greens. 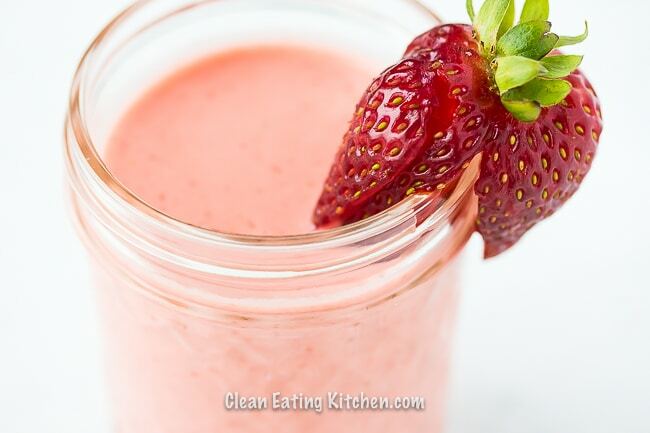 Next, make the dressing by combining ½ pint of fresh strawberries (about 1 cup) into a high-speed blender. Add the coconut yogurt, vinegar, honey, and olive oil to the blender. Turn the blender on high for about 30 seconds or until the dressing is fully combined and creamy. 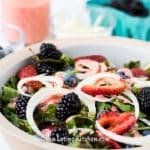 Add the berries on top of the salad just before serving. 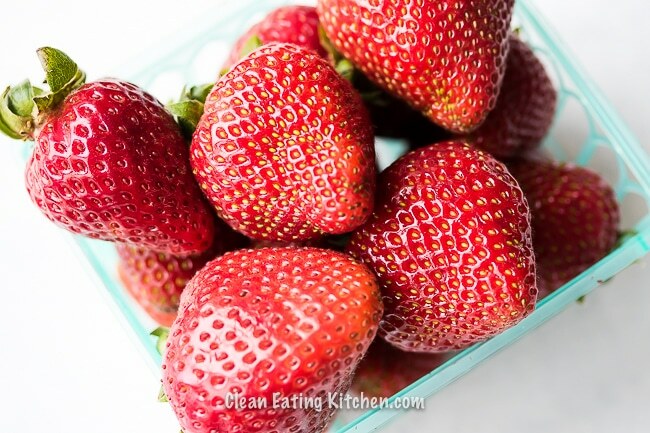 If you prefer to use frozen strawberries in the dressing, place 1 cup in the fridge to defrost overnight before blending. Here’s a pin to save this recipe to your favorite healthy recipes Pinterest board! 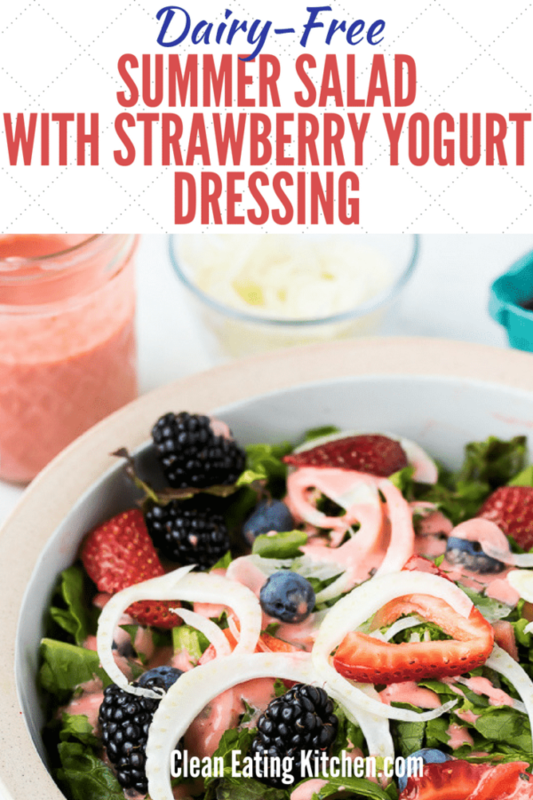 Strawberry + yogurt + salad …together! Heaven!